At PlanoBibleChapel we strive to find a balance between the biblical convictions that are essential to Christian faith, the biblical beliefs that we hold as a church but other godly people may view differently, and the personal convictions that we hold individually for a fruitful walk with Christ. This desire for balance requires that we recognize the differences between biblical convictions and personal boundaries. When we understand as a church family the importance of a particular belief, thought, or preference, we’ll be able to agree on the essentials of the Christian life and better prepared to disagree on less important ones. In other words, when we recognize the differences between convictions and preferences, we’ll be able to celebrate our life in Christ and cooperate as the body of Christ in a way that leads to unity. Where we are as Christians: We know the Truth—God and His Word! God, the Supreme Being, exists. He is Truth and the standard for absolute truth. God has revealed Himself and His Will for us in a book that is absolutely true, the Bible. We can know truth by knowing God and knowing Him personally through His Word. Where we are as a culture: Absolutely no absolutes! Our culture says, “There is no such thing as objective, absolute truth. Something can be true for me, and its opposite true for you, and that’s OK! We create our own truth.” Insisting that anything is absolutely true is considered intolerant and ignorant (except of course, the belief that there are absolutely no absolutes!). Where we are as Christians in our culture: When worlds collide! We must know the difference, not only between what is true and false, but also between what is objective and what is subjective and what is essential and what is non-essential. That’s not always easy because not only do unbelievers disagree with us – Christians often disagree in areas of personal convictions and biblical beliefs. 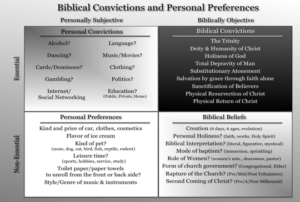 What are Biblical Convictions and Personal Preferences? A conviction is a strong persuasion or belief about the truth. Biblical convictions are the doctrines held to be right or true by the church throughout the centuries. Personal convictions are based upon scriptural truth and applied to an individual believer’s life. Personal convictions provide boundaries for an individual to live a godly life. Biblical beliefs are things that can be demonstrated in Scripture, but are non-essential providing room for differing theological positions. Personal preferences are things that relate to our convenience and comfort. Keep man-made rules (personal convictions) that are not specifically spelled out in Scripture (biblical convictions and beliefs) to a minimum (Col. 2:16-23). Remember that your personal convictions may be essential for your walk with the Lord Jesus, but not necessarily wrong for someone else. God uses men and women who live by grace in holding their biblical convictions, biblical beliefs, and personal convictions. He is glorified by believers who are committed to living a sacrificial life of conviction rather than compromise in a godless world (1 Cor. 10:31).